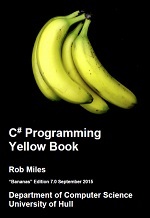 Learn C# from first principles the Rob Miles way. With jokes, puns, and a rigorous problem solving based approach. This book offers several hands-on labs along the way to help you build and test programs using skills you've learned up to that point. In the final lab, you'll put everything together. From objects to garbage collection and from exceptions to interactions, you'll learn C# in a way that engages and entertains your brain. Study � look at programs written by other people. You can learn a lot from studying code which other folk have created. Figuring out how somebody else did the job is a great starting point for your solution. And remember that in many cases there is no best solution, just ones which are better in a particular context, i.e. the fastest, the smallest, the easiest to use etc. Persistence � writing programs is hard work. And you have to work hard at it. The principle reason why most folks don't make it as programmers is that they give up. Not because they are stupid. However, don't get too persistent. If you haven't solved a programming problem in 30 minutes you should call time out and seek help. Or at least walk away from the problem and come back to it. Staying up all night trying to sort out a problem is not a good plan. It just makes you all irritable in the morning. We will cover what to do when it all goes wrong later in these notes.